When the Japanese bombed Pearl Harbor, the State Patrol needed someone to man the beaches in search of an advance party of Japanese. "What they didn't realize," said Mr. Boyd Rupp, "was that the West End at that time was an impenetrable jungle!" They actually had to cut tunnels through the thick salal brush that sometimes grew as tall as ten feet. 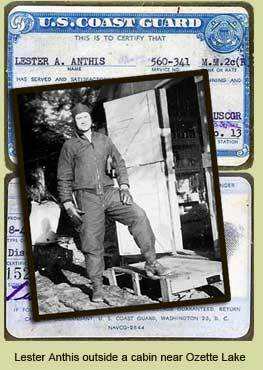 He was debriefed at McCord Air Force Base in 1941 and arrived on the west End in 1942 after the deputy sheriff was murdered. Adack had just been bombed by the Japanese, and the Navy had no idea where the Japanese fleet had gone to after that. "They started building a huge fortification at Neah Bay. There were plans for guns with 110 foot barrels and 16 unch bore rifles. It was all going to be underground. There were five thousand new employees out there." Mr. Rupp's job was to search for scout parties of Japanese, or any traitors and sympathizers. He manned the beaches in logging clothes, from caulk boots to a tin hat. He kept track of remote log cabins and shacks that might shelter a Japanese spy. The walls of the shacks were insulated with gray felt paper Mr. Rupp said of these shacks, "I never saw so many fleas in my life!" Another of Mr. Rupp's duties was to notify the settlers that in case of military action, they were expendable. There was only one highway on the west End, and it would be used for military purposes only; there would be no rescue or evacuation. Mr. Rupp said the response to this was usually something like, "Well, there are six shells in my rifle, and there'll be six dead enemies on my porch." Mr. Rupp noted that the American people were pulled together in loyalty and devortion for their country by the war effort. Mr. Rupp never saw any Japanese on the beaches. 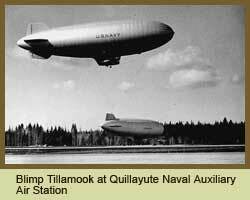 He did, however, witness the bombing of a submarine along the coast of Neah Bay. Three Quillayute attack planes that were used for strategic bombing, with single engines, twice as big as a "Hell Cat," swooped over the tree line and each released a can the size of a barrel that exploded in the water three hundred yards northeast of Wada Island. This bombing was never publicized because it might have hurt the war effort. Mr. Rupp said that much of the war's success was due to the heroic efforts, large and small, of individuals. He mentioned a telephone operator, Nell Siegfried, who went to great efforts to keep track of every body in town, and get all of their messages to them, "She should get a posthumous medal!" declared Mr. Rupp. He nolted people from all over who donated their German Shepherds and Collies to the war effort top be re-trained to guard the beaches and coast-line. The re-training of these valuable animals was so intense that the dogs could not be returned to their original owners because of their extreme viciousness. Mr. Rupp also mentioned a certain Skipper who would go into town and pick up any crew members who began raising hell, "Why, he would give that man 20 or 30 hours of extra duty, on the spot!" said Mr. Rupp. There were about 2,500 extra sailors on duty on the west End, and all of them needed some leave at some point. The only place to go was Forks. The town was never in danger from the sailors, even at their most drunken, because of the vigilance of that one Skipper. The fortification at Neah Bay had just hauled a cement mixer in and gotten it ready to pour the foundation when the war ended. The engineers got together, and poured one square yard of concrete. While the concrete was still wet, the female secretaries imprinted their fannies in it, and the engineers inscribed their names. Written across the middle is the inscription, "This is where four million, (some-odd) thousand dollars went." Boyd Rupp was the speaker at a meeting of the West End Pioneers in August 2005. The Community Museum is a project of community organizations and Tribes across the Olympic Peninsula and the University of Washington.